Superoxide Dismutase (SOD) was proposed as a potential scavenger of carbon radicals in ancient carbonized silk fabrics. Ancient and artificially carbonized silk samples were treated using this method. The optimal experimental conditions of the treatment were determined by variance analysis. The effects of the scavenging on carbonized silks were investigated by electron paramagnetic resonance (EPR). The results showed that the carbon radicals in both ancient and artificially carbonized silks were cleared to a great extent. The ageing resistance of the treated samples and scanning electron microscope (SEM) images of samples before and after treatment ensured that the treatment would not aggravate the deterioration of silk. Thus, the potential of SOD to scavenge carbon radicals in historic silk was demonstrated. Our research may help to alleviate further degradation which could occur during preservation of silk. The production of silk fabric was a great invention in the history of human civilization. Numerous archaeological excavations have proved that sericulture emerged in the Yellow River Basin and the Yangtze River Basin as early as 5000 years B.P. In approximately the third century B.C., silk began to be transported to other countries through the Silk Road, which promoted cultural and economic communications. As silk is susceptible to different ambient factors, e.g. light, heat, water, and microorganisms, most of the historic silk fabrics lost their mechanical strength and became brittle, research on the mechanism of silk degradation is still at a groping stage ,. In a previous article , we studied several ancient silk fabrics by means of electron paramagnetic resonance (EPR) and Raman spectrometry, and discovered carbon radicals accumulated in them. The Raman spectra showed two peaks (D and G), which are indicative of carbonization. The EPR spectra of the ancient samples showed a characteristic sharp absorption centered at g =2.0037 without a hyperfine structure, and have been identified as those of carbon radicals. Thus, this kind of ancient silk fabrics was referred to as carbonized silk. Although these carbon radicals were relatively stable during burial after thousands of years, more carbon radicals will generate after excavation as the environment changed totally and cause further degradation in ancient silk fabrics -. Therefore, it is necessary to scavenge the fresh carbon radicals in carbonized silk in order to avoid potential hazards. Superoxide dismutase (SOD) is an important oxidoreductase against oxidation damage ,. It is soluble in water and can be used under room-temperature. Due to the 100% protein composition which is similar to silk protein, SOD is highly compatible with silk. The mild experimental conditions could ensure other forms of preservation will not be affected ,. Thus, SOD solution can be a candidate scavenger for carbon radicals within ancient silk fabrics. The present study aimed to demonstrate the capability of SOD as a potential radical scavenger for ancient silk fabrics. Because genuine historic silk fabrics were not appropriate for a large number of repeated tests, artificially carbonized silk samples were used as substitutes. To determine the optimal experimental conditions, variance analysis of double factors cross classification without repetition was performed. The scavenging effects were characterized by EPR. The ageing resistance of the scavenged samples was evaluated via dynamic mechanical analysis (DMA). Then, the method was applied to ancient carbonized silk fabrics. The fibre morphology of samples before and after treatment were observed using scanning electron microscope (SEM). Ancient carbonized samples were unearthed from Balingshan Tomb (403 B.C.–221 B.C. ), in Jingzhou, Hubei Province, China, denoted as JZ (Figure 1). 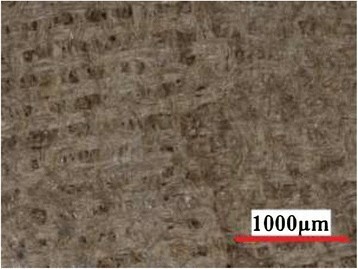 Modern silks were supplied by Guanghua Silk Co. Ltd. Superoxide dismutase (BR, activity 1750U/mg) was manufactured by Worthington Ltd.
Micrographs (×100) of JZ (scale bar, 1000 μm). According to references ,, modern silks were heated under 230°C for 40 h to obtain artificially carbonized samples with exceedingly low strength, denoted as 40hTH. JZ was heated under 230°C for 6 h (6hJZ) to mimic the generation of fresh carbon radicals in storage. The SOD solutions with concentrations of 0.01%, 0.05%, 0.10%, 0.20% (w/v) were prepared by dissolving SOD into distilled water. The scavenger solutions were sprayed onto 40hTH (the sample area to mixture volume ratio was 1 cm2: 10 μL) at room-temperature for 24 h and 48 h respectively. Variance analysis of double factors cross classification without repetition was performed to obtain the optimal concentration and scavenging time. The scavenging effects were evaluated by analysis of samples before and after scavenging with electron paramagnetic resonance. For EPR measurements, each sample was weighed and placed into standard quartz EPR tubes. The EPR spectra were performed with a JEOL JES-FA200 EPR spectrometer at room temperature. The microwave frequency was 9.06 GHz, the microwave power was 0.998 mW, and the modulation amplitude was 0.35 mT. All signal intensities were normalized to be equated with sample weighed 1 mg. The clearance rate of carbon radicals through the change of EPR signal intensity was calculated as follows. where I o and I' represent the EPR signal intensity of the sample before and after applying scavenger respectively, m 1 is the clearance rate of carbon radicals. where I 0 represents the EPR signal intensity of the ancient fabric before artificial carbonization. I represents the EPR signal intensity of the ancient fabric after artificial carbonization. I' represents the EPR signal intensity of the ancient fabric which was artificially carbonized and applied with SOD. 40hTH before and after being treated with 0.05% SOD solution was artificially aged at 60°C and relative humidity of 80% for 72 h and cut into strips of 1.0 cm × 5.0 cm. Then the tensile strength of these samples was examined using using a Dynamic Mechanical Thermal Analyzer Q800 (TA instruments Inc., USA). Five replicates were analyzed for each sample. SEM images of the ancient carbonized silk fabrics fibres and artificially carbonized silk samples before and after treatment by the superoxide Dismutase (SOD) were observed with a JEOL JSM-6700 F scanning electron microscope at 5.0 keV accelerating voltage. Samples were mounted on an aluminum stub and sputtered with aurum before observed. 40hTH were treated with SOD solution at different concentrations and time spans. 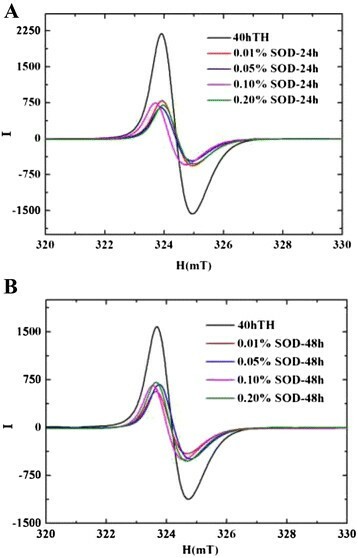 The EPR spectra of 40hTH applied with SOD solution at various experimental conditions were shown in Figure 2. 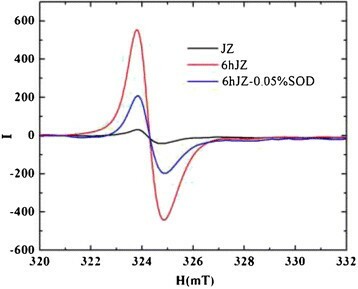 The EPR spectra of the samples showed a characteristic sharp absorption centered at g =2.0037 without a hyperfine structure, and have been identified as those of carbon radicals . It is clear that a multitude of carbon radicals were generated in the artificially carbonized silk samples. And after treatment by SOD with various experimental conditions, the amount of carbon radicals declined to a large extent. On the basis of EPR results, the clearance rates of carbon radicals were calculated (Table 1). Afterwards, variance analysis of double factors cross classification without repetition was adopted based on all data calculated (Table 2), whereby the optimal experimental conditions were selected. The EPR results of 40hTH before and applied with SOD solution with different concentrations (A) time of treatment =24 h (B) time of treatment =48 h.
Table 1 shows the clearance rates after treatment by SOD on 40hTH are between 61% and 71%, and the choice of 0.05% SOD and scavenging time of 24 h would achieve the best results. The variance analysis results in Table 2 indicated that Factor A and Factor B are insignificant for clearance rate. It means that with the increment of the mass fraction from 0.01% to 0.20% and scavenging time from 24 h to 48 h, there is no obvious variation between the results. That means SOD can achieve good scavenging effect under low concentration and little time. Therefore, concentration of 0.05% SOD and scavenging time of 24 h were adopted as optimal experimental conditions. FA < F(0.05,1,3), thus primary hypothesis H0A is conformed, FB < F(0.05,3,3), primary hypothesis H0B is also conformed. As shown in Figure 3, a large amount of fresh free radicals were generated after accelerated carbonization, indicating the potential threat of ancient silk during storage. After SOD solution was applied, the calculation shows m2 is 65.6%, suggesting that SOD solution can effectively scavenge the fresh free radicals generated after excavation. EPR results of JZ which is artificially carbonized for 6 h and applied with SOD for 24 h.
Ensuring that the treatment would not exacerbate degradation is vital to a novel conservation method. Although SOD has not been used on silk before, there are related studies proving that SOD will not have long-term effects on other protein-based materials, such as skin and food -. Tensile strength of artificially carbonized and scavenged samples after hygrothermal ageing are compared in Table 3. Obviously, there is no impact on the tensile strength of the samples from application with SOD solution. 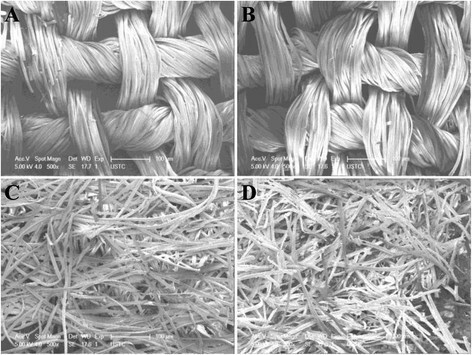 As shown in Figure 4, after treatment by the superoxide Dismutase (SOD), the fiber morphology of both the ancient carbonized silk fabrics fibres and artificially carbonized silk samples are almost the same as that before treatment. Hence, the treatment would not precipitate the ageing process of silk fabrics. SEM images (×500) of silk samples before and after SOD treatment (A) 40hTH before treatment (B) 40hTH after treatment (C) 6hJZ before treatment (D) 6hJZ after treatment. The newly-discovered carbon radicals in silk can be an adverse factor related to the preservation of silk artifacts. Superoxide Dismutase (SOD) was used to scavenge carbon radicals in ancient and artificially carbonized silk fabrics. The experimental conditions of this treatment were determined through variance analysis. It was found that the fresh carbon radicals generated during storage can be effectively scavenged through this method. In addition, the ageing effects of the treated samples and SEM images of samples before and after treatment suggest that this treatment would not accelerate the ageing of silk fabrics. Therefore, the candidacy of SOD as a candidate scavenger of carbon radicals for ancient carbonized silk was demonstrated preliminarily. XB designed the experiment; prepared the samples; performed the data analysis; wrote the manuscript. YG helped for writing and revised the article. HY performed analyses and interpreted results of EPR. DG helped for designing the experiment; revised the article. All authors read and approved the final manuscript. This work was financially supported by the Key Projects in the National Science & Technology Pillar Program of China during the 11th Five-Year Plan period (2010BAK67B13). The EPR and DMA experiments were performed at Instruments’ Center for Physical Science, University of Science and Technology of China. Technical support from Dr. Zhanyun Zhu was gratefully acknowledged.